"In order to be a successful farmer today, you need to know all that occurs in the urban and modern world - as well as a full skill set for rural living and working with your hands." Besides being a sustainable, organic grower, Eva Worden is a teacher in her community. 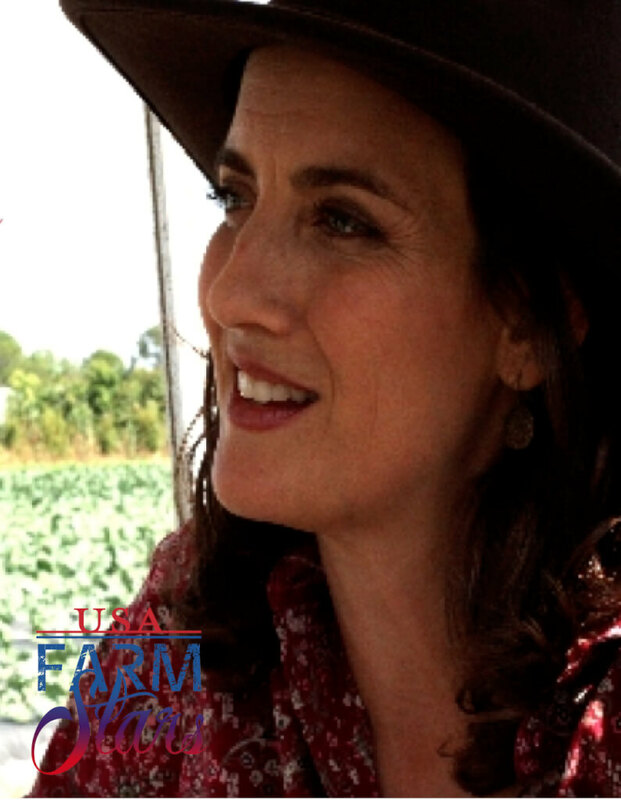 Eva and her husband have now taught thousands of people on sustainability and local organic agriculture through workshops, farm tours, university courses, conferences, and an intensive farm apprenticeship program. For this, she could be nothing but a Farm Star. Food: Lots of fresh organic vegetables, simply prepared. Drink: Water – it’s the most hydrating drink from the earth. Blue Jeans: No particular brand but I wear them most days. What's your relationship status? Married to Chris. Do you have children? Do they work on the farm with you? We have two and sometimes they work on the farm and at markets. They’re aware of all the occurs on the farm but they have their own lives. Favorite Thing to do AFTER work: Spend time with my kids and husband. Mantra: “Fresh.Local.Organic.” I dedicate my work to improving lives through fresh, organic food. I’ve been to Israel and I’d like to go to Cuba. My father was from Cuba and I’d like to see where he grew up and visit that part of my heritage. I’d also like to see the innovative agriculture that has developed over the last several decades. No amount of money can buy a healthy environment. The resources of water, air, soil, wildlife, and ecosystems cannot be bought. Money can be put toward the restoration and protection of those resources and it’s a smart investment for us as individuals and as a society. They are all common resources we need to live healthfully. No amount of money can buy a healthy environment. The resources of water, air, soil, wildlife, and ecosystems cannot be bought. I studied horticulture in college after studying a varied, large curriculum including philosophy, literature, mathematics, the usual. When it came time to choose a major, I chose horticulture because it would provide meaningful work that was valuable to others and compatible with my areas of interest. Then I received a fellowship for a masters in horticulture and continued on my path and learned scientific research methods. I knew that to see more organic farms in the world there would need to be more of a understanding about social elements of farming so I studied social-ecology and ecosystem science and multidisciplinary forestry at Yale. I became a professor of horticulture and was farming part time and loved it. After our first child was born we knew we wanted to do it full time and raise our kids on a farm. We bought a farm that was formerly a citrus farm, turned into a horse pasture. Over the years we have turned it into a thriving family vegetable farm. Because I was on a tenure tract as a professor at a university a lot of my colleagues thought I was crazy to go into this type of risky venture. The resistance I got from the people I respected was a hurdle but it didn’t stop us. The need for such a wide diversity of skill sets like mechanics, irrigation, plumbing, electrical, infrastructure, people skills, horticultural skills. We enjoy wearing those different hats and changing courses during the day and throughout the seasons and the year. People think farming isn’t difficult and make jokes about farmers. But successful farmers know many practical skills, some which are dying out. Tell us about a day on the farm. When does it begin and end? A normal day on the farm starts at 4:30 a.m., getting prepared in the house, morning meeting with the crew around 7, work all day until 3:30 or 4. Then we try not to allow the work to bleed into all hours even though it sometimes will because of weather and events on the farm. On farmers’ market day we start around 2 a.m. Trucks leave early and arrive while it’s dark in the city. We prepare the market booth, work all day and come home 12 hours later. I’m happy when the crew is working at full capacity and the tractors are moving through the field, the plants are growing well, the weather is great and the customers received the produce and are thrilled with what we’ve grown. I don’t generally get frustrated, but when there’s a weather event such as a freeze or flooding rain it can be disappointing. But I know it is out of my control so I roll with it and carry on. I have learned that eating organic food can change a person’s life. My farm members and customers share stories of their improved health and even improved personal relationships. People associated with the farm meet others and form social networks of like-minded people. The farm and the surrounding community can become an important cultural institution and resource for living in a healthy and environmentally aware way. It’s somewhat of a new model to acquire food like this but it has been successful on our farm and other similar farms. Connecting people to the source of their food can continue to grow to benefit our larger society. I have learned that eating organic food can change a person’s life. My farm members and customers share stories of their improved health and even improved personal relationships. Maintain a balance in your life. There is always more work to be done on a farm, and because our passion and identities are intertwined with the farm, we will work endlessly on them. It’s important to take time for family and recreation. I may have touched on this earlier, but the idea in our culture that farmers are uneducated and in some way not modern. In order to be a successful farmer today, you need to know all that occurs in the urban and modern world as well as a full skill set for rural living and working with your hands. It’s an extremely demanding line of work that requires passion and dedication. There is a need for public education about farms and farmers. What would you say to people who aren’t farmers? Connect with a farm for your basic food needs and support farm-friendly policies and laws. Farming is essential to society and you can find opportunities to support it. Whether it is in the foods you buy and eat, in your own field, profession, or community, you can promote farming for sustainability and health. Consider farming as viable career option because it’s fulfilling and meaningful work. Connect with a farm for your basic food needs and support farm-friendly policies and laws. Farming is essential to society and you can find opportunities to support it. I think our attention should be paid to the message of agriculture ... that we as a society choose to support the things which are life-enhancing. Preserve the environment while those which are potentially toxic or degrading should be avoided. Right here on the farm. We all grow and change but this is what I love to do, so why change it? I will continue to reach out in a variety of ways to help people gain access to organic food.